Award winning Equi=Tech Wall Cabinet Systems are factory preassembled power distribution centers for hard wiring balanced AC power into a facility – a complete balanced power distribution system built into a wall cabinet. Only minimal installation is required eliminating many expensive hours of labor and hard to find electrical parts. All the necessary components such as transformer‚ breakers‚ GFCIs‚ surge protectors and line filters are factory assembled using the highest quality materials and components. Wall systems are designed to blanket an entire facility with clean and phase coherent balanced AC power that remains stable regardless of how they are loaded down. 5‚ 7.5‚ 10‚ 15 and 20 kVA sizes provide 50‚ 75‚ 100‚ 150 or 200 amps respectively – ideal capacities for most studios and modestly sized theaters or auditoriums. These systems utilize the same precision toroid isolation transformers as Equi=Tech rack systems but they are much larger with a greater capacity. Wall systems are the easiest way to provide clean power for a larger facility‚ doing so with the assurance that the system will remain quiet regardless of what equipment is used or added to it at any time. Wall system’s components are housed in a sturdy NEMA 1’ steel cabinet and feature a rugged industrial-duty AC distribution panelboard with commercial grade circuit breakers‚ transient voltage surge protection and ground fault circuit interrupters. The models 15WQ and 20WQ have a 2-part cabinet with an additional lower section that houses their massive toroid transfromer. The cabinets come in black or light gray with a chrome latching handle and an enamel white interior. 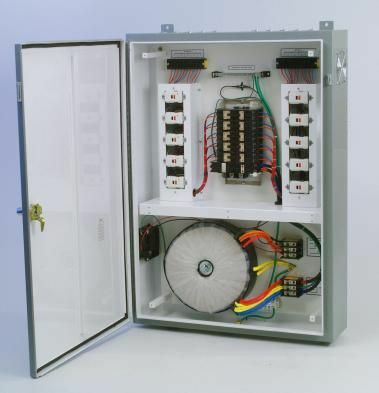 Wall cabinet systems are approved safe and are listed in compliance with ANSI/UL Std. 101’ for power distribution equipment. Equi=Tech Wall Cabinet Systems are designed around Equi=Tech’s revolutionary “Q-type” isolation transformer. “Q” transformers are designed to have exceptionally low line impedance and include two Faraday shields for superior isolation (>100dB CMR) from high frequency RF‚ EMI and harmonic currents. “Q” transformers are acoustically quiet even in locations where there is considerable utility line distortion and poor power quality. They are much larger than standard toroids with the same power rating and they run just slightly warm when operated near their rated load current capacity. A proprietary winding design eliminates high inrush current problems that are inherent in toroid transformers. They also provide for broad band distortion-free playback under the most demanding load conditions. Their performance is exceptional where power hungry amplifiers might otherwise choke during periods of high peak current demands when powered by a conventional AC supply. “Q” transformers add tightness and startling definition to low frequency music. In rooms with less than ideal acoustical features that are known to affect low frequency sonic quality‚ they will restore the low-end in dramatic fashion‚ They are a must for recording studios that perform mastering work. The Model Q is Equi=Tech’s flagship product. It is the result of many years of experience and application research in the field of balanced AC power. It is highest quality and the best performing balanced power system we have ever offered. Every component specified in its design has been selected from years of research and testing in professional and consumer high definition A/V systems in both analog and digital formats. Each component used in the Model Q was chosen for its superior quality and performance and cost was no object. For example‚ the material used in the Model Q transformer core is made of a state-of-the-art magnetic steel alloy and none is spared in fabrication. The core material is the most efficient there is‚ nevertheless the Model Q transformer has twice the mass of similarly rated competitive products. 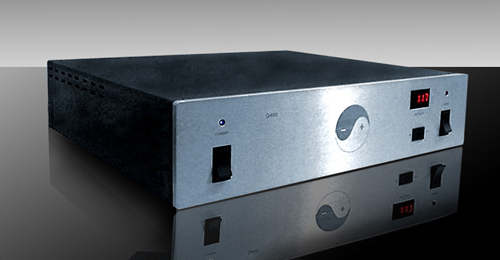 It drives amplifiers and other high current pulse type loads without skipping a beat. Power factor remains virtually stable regardless of the type of demand load. Mil spec oxygen free copper is used throughout the Model Q assembly to further reduce random high frequency current distortion. This improves an already near perfect mirror image output and further widens its range of noise attenuation. The Model Q’s switches and circuit breakers are the finest made and they are duty rated for over 1/2 million operations. Every component part used in the Model Q has been selected because it is the best of its kind. There is nothing that compares in quality or performance to the Model Q. Though the Son of Q is clearly superior to our competitor’s products (and cost about half the price‚) the industry benchmark standard of performance originates with the Model Q. Son of Q benefits from the trickle down technology developed over the years refining the Model Q‚ therefore the Son of Q clearly deserves the name. Both clearly stand above the rest in precision design features and performance. But make no mistake about it‚ the Model Q in all its variations and sizes is the gem of the entire balanced power industry. No balanced power product compares to the Model Q and they are built to last a lifetime. Equi=Tech has been making balanced power products longer than anyone in the industry‚ setting new standards in the field of power quality since the early ’90s. There is no limit to how far we will go to raise the bar in power standards and audio-video quality. The Model Q is our flagship product. Model Q’s can also drive a live sound system adding tightness to bass reproduction that can be very difficult to achieve in some rooms considering the various acoustical problems that many rooms present. For an amplifier to accurately reproduce low frequency program material‚ it must have power on demand the instant it’s needed. The consequences of lagging power delivery is a compressed and flat sounding amp with a booming‚ bloated sounding bottom end. When an amplifier’s power supply is rendered less inefficient by poor power‚ it struggles to reproduce low frequency material and it logically follows that the mid range and high frequency material loses definition and accuracy as well. Poor power affects the full sound spectrum. Model Q’s provide stable and reliable power quality so your gear will sound as good at noon in an office building as it does at 3AM in the studio. Model Q’s level the playing field whenever and wherever they are used. The Model Q has a simple yet elegant appearance. It features an anodized aluminum front panel that is available in black or silver. A front panel LED voltmeter indicates voltage at the input or output depending on the position of the voltmeter mode switch (IN-OFF-OUT) There is one blue LED indicator light above the input power switch and one above each output standby switch indicating power status at both the input and the output. The input power LED also doubles as a TVSS status light that indicates active surge protection when lit. In the rare event that it stops working and the output LED still works‚ this indicates that the surge protector has taken too many nuisance voltage spikes and its days are done. In the rare event that this occurs‚ the Model Q’s grounded Faraday shields provide excellent redundant surge protection until the TVSS module can be replaced and it is an inexpensive and easy thing to do. On the rear panel‚ there are 1’ AC outlets provided (more in the larger versions.) One GFCI outlet is independent from the front standby switch(es) and is constantly left turned on for use with components that require continuous power for a clock or to maintain volatile memory. Of the 10 remaining outlets‚ 6’(white) are for analog components such as amplifiers and pre amps and 4’(gray) are specially filtered outlets for digital components. A circuit breaker on the rear panel protects the system from overload and from potential short circuit fire hazards in electrical power cords and downstream connected equipment. Model Q’s are offered in 7 different sizes ranging from 1kVA to 10kVA load capacities. Most Model Q’s that are rated at 2kVA or less require a 120 Volt supply circuit to operate. (The 2RQ-E and 2RQ-EA require 208/240 Volts.) 3kVA and 5kVA models require a 208 or 240 Volt supply as do the 7.5kVA and 10kVA models. The chart below indicates the circuit size and standard plug type used to connect the Model Q to the source power outlet. The Son is offered in 3 different sizes. The original Son of Q model has a 1500 Watt capacity and plugs into any standard 15-amp 120-volt wall outlet as does it’s smaller sibling‚ the Son of Q Jr.‚ which has a 1000 Watt AC load capacity. The largest of the three‚ the Son of Q Sr. can drive 2000 Watts of load but it requires a full sized 20-amp outlet such as the kind found near most modern kitchen countertops. They run luke water warm at the most when loaded up to full capacity. The entire Son of Q line has been thoughtfully designed with many years of balanced power manufacturing experience behind them. They are the new generation of standard systems that we build‚ refined beyond any product that we have ever offered in their price range. Son of Qs have a simple yet elegant appearance. They feature an anodized aluminum front panel that is available in black or silver. On the front panel there are 2 LED indicator lights‚ one above the input power switch and one above the output standby switch that monitor power status at the input and at the output of the unit. The input power LED doubles as a TVSS status light that indicates active surge protection when lit. On rare occasion if it stops working and the output light still works‚ that means that the surge protector has taken a big hit and expired. In the rare event that this happens‚ the Son of Q transformer’s grounded Faraday shield maintains excellent backup surge protection until the TVSS can be replaced. On the back panel‚ there are 1’ outlets provided. A GFCI outlet is independent from the front standby switch and is constantly left turned on for use with components that require continuous power for a clock or to maintain memory. Of the 10 remaining outlets‚ 6’(white) are for analog components such as self-powered monitors‚ amplifiers‚ pre amps‚ crossovers etc. and 4’(gray) are specially filtered outlets for digital gear. (Simple plug strips can be added to rack rails by the dozen.) A circuit breaker on the rear panel protects the system from overload and from potential short circuit fire hazards in electrical power cords and downstream connected equipment. Open the lid on a Son of Q and see for yourself how well made these systems truly are. There is no skimping on how Son of Qs are designed and built. All three models use isolation transformers with an enormous mass that rival competitors’ products with twice the current rating. The Son of Q Jr. is modestly rated at 1000 Watts with a transformer that compares to our competitors’ 20-amp systems. The Jr.’s heart is massive but the Son of Q Sr. is nearly twice the size. Son of Q transformers are designed to operate with an extremely low impedance and a very low magnetic flux density. This means that under load‚ they operate with a lot of magnetic headroom left in reserve and they can transfer current quickly upon demand to amplifier power supplies when a large transient occurs. Their magnetic shields allow for use near sensitive equipment such as single-coil pickups and tape machines. Most of today’s project recording studios do not require a high level of continuous current to operate efficiently. The power supplies simply do not have the mass and size that require a constant high current power source but at times they do demand high current in short bursts‚ especially class AB monitor amps and self-powered speakers. The Son of Qs like the Model Qs are one of the few power products in the marketplace that routinely maintain a high power factor when used with high current pulse demand loads. They actually enhance playback quality rather than get in the way and make an amplifier sound compressed. Son of Qs are designed to be a perfect fit in project studios with small to medium sized boards‚ an outboard rack or two‚ a keyboard setup and self-powered monitors (or modestly sized monitor amps.) Like the Model Q‚ their performance specifications are rated for top engineers and professionals in the industry but their price is more affordable. Son of Qs meet the highest performance standards in the power industry ̵’; standards that we ourselves created because we have been building balanced power products longer than all others. Equi=Tech literally wrote the book on balanced power. (1996 National Electrical Code Art. 530 Part “G” and 200’ NEC Art. 647 were written by Equi=Tech’s President. The new 2006 IEEE Greenbook now credits Equi=Tech and lists balanced power as a recommended method of eliminating noise in data processing systems.) The balanced power revolution started here in the early 90s and we have been setting the standards for a very long time. It’s no wonder that we do it so well. From the very beginning‚ Equi=Tech has been making new strides into uncharted territory. Proprietary component specifications and numerous US patents provide only a hint of the expertise we have acquired through years of experience and innovation. We are true pioneers and the Son of Q is a fine example of what we build. Equi=Tech products have earned many awards as well as a reputation in audio/video‚ television‚ theater‚ sporting and performance venues‚ R&D and scientific environments for effectiveness‚ reliability and as the power product of choice by top professionals around the world. Here are a few of the many hundreds of unsolicited letters we have received over the past months and years from our customers. We think you may be interested in hearing from some people that use Equi=Tech systems with their audio equipment. We will periodically be adding to the list here so check back often.